I can't understand mate what you are saying. Is his given application is cause of virus? So it’s better to not download from his link? The post you quoted is almost 5 years old. It's referring to mining software (CcMiner, Claymore Miner, ...) that often requires a configuration of Anti-virus software to not be considered threat - resulting in that it's being removed after Awesome Miner downloaded them. Since the last ~2 years Awesome Miner automatically configures exclusions for Windows Defender and since then it's less common to run into these problems. also, it would be great, if we could compare current miner profit/revenue estimate with its past values (1..10 minutes ago) and use the comparison result as the rule trigger. what I'm trying to accomplish is a rule, that could force the profit switching for a miner in a case, when current profit estimate becomes significantly lower. some algos have big profitability spikes that don't last too long, in this case the rule could force the miner to check current profit switching list again. now a miner could waste its hashpower and mine an unprofitable coin for a long time, if you are using a big profit switching interval or/and a big "minimum time to stay on a pool" value, and the "Current estimate" is selected as the profitability stats source. or, if there's a way to force the profit switching without additional rules - I will be glad if you could help me to figure it out. You do have a rule action called "Run profit switching", but there are not really any triggers like those you request. The current Revenue/Profit trigger can only compare with a static value. It's possible to manually trigger the profit switching to run for the selected miners. You can create a rule and enable "Support manual activation via the toolbar". You can then add the action called "Run profit switching". Not a nice automatic solution, but in case you ever need to force it manually. The rig 4 you can see in the capture, down in GPU says that I have 1050, 1050, 1060 And that was before, some time ago. In the MAP GPU box if you see correctly 5x1070 1x1080ti, that is correct. But even if I map the cards, I still see 1050, 1050, 1060 etc ... And above all I have problems with the automatic speed, as it assumes other GPUs because it uses a different speed, usually a low speed, with which the GPU heats me. I had to force 80% GPUs in that profile. How can I make AM recognize my real cards in GPU with their real names and real characteristics? As much as I remove the Mapping mark and then map again, the old cards keep appearing. It would also be interesting that if an api gives a failure (it can not read the api) it appears in notifications, thus I will not be hours undermining the same difficulty without knowing that something fails. Can you please send me the API Report for this specific miner? You can send via PM. Thanks! Sorry, I found it, I sent it to MP. Let's see if we can see what happens. Because to me the problem that it gives me is that it does not do a good control of the automatic fan and it is 80 degrees and 60% fan. I have to put profiles with the FAN fixed at 70 or 80% but I like more the performance of the car, but this confusion of cards must be. Thanks for the report. I can see that you have set your own names of these GPU's, and that's why the names from Awesome Miner doesn't show up in the list. Please select each of the GPU's in the GPU tab and click the "Set name" button. If you remove your custom names here you will see that Awesome Miner will display the default names instead. Well, what a silly problem, I have corrected it, but this poses another problem. Because using an OC profile with automatic FAN, some cards reach 80 degrees and do not exceed 60% of FAN? it is assumed that at that temperature in automatic, the fan should go much faster than 60%. We know that in Aftherburner you can create a speed line based on temperature and it would go automatically. Here it does not exist, but there could be a slider button or a number from 1 to 10, where the FANS were more aggressive, that means they go faster than revolutions at a lower temperature, or higher. Being 10 very aggressive and 1 very soft. Or something similar. Because although native OC works very well, its big problem is the automatic control of the fans. Use rules, fixed fans and 2 or more profiles. If the temperature reach 70°C for example make a rule to change to another profile with faster fixed fans. I think it is the easiest way. And in my opinion, if you mining, never use automatic fan control. Got some weirdness with MiniZ miner... See pic. Any ideas? Is this the same fan speed behavior explained by @darkneorus here? It's the mining uptime reported over the MiniZ API that sometimes give very high numbers. I run into the same issue yesterday. What I will do for the next release is to use the mining uptime calculated by Awesome Miner instead. Is there a way to add custom coins? I remember there was a script maybe? The best is probably to choose 3-4 mining options and switch between them manually. Or example, at night in China, one project is more profitable, and in the afternoon, another. This market is changing very quickly, and automation can fail or be hacked. For large or medium players in this market this is relevant. See the recent dev releases, currently you can already add dynamic updates to difficulty, block reward and soon after next major release addition of nethash, block time + specifying calculation method will follow suit. so soon you can do this all in AM. It is not feasible to do so, power can be, but it is not appropriate. I have 6 rigs, and I use about 20 Algos. I have established about 100 OC profiles. What you are saying is that you make another 100 OC profiles with a fixed fan speed. I'm sorry but that's Chinese work. There must be simpler options than what is proposed, which for an RIG may be worth and even so, there would be several profiles, at least 2 for each SOMETHING. @Patrike, in the rules, you can know the temperature of the cards and put a rule. But I do not see that it works. The rule can detect the temperature, 80 degrees in my case, and I indicate that the fan works fixed at 80%, but it does not. It seems to me that this one more thought for asic, surely it would have to restart miner in GPU, but to do it also it lowers the temperature and the rule does not shoot. There some way to do what I indicate, and to apply a fixed speed to all the cards of the rig, without having to restart miner ?, would be an ideal solution for this situation, and summer is near. I have a problem with rebooting the external miners through rules. i guess this should have been answered already but the search didn't help and I'm not going to read through 470+ pages. the problem is when I set rules to reboot my antminer S9 by ssh command->reboot system, the rule is triggered, even the notification which i have set for the action will pop up but the reboot action does not happen. more interesting is, when I select the miner and go through tools-> Antminer & ASIC-> reboot (via SSH), that works and the miner reboots pretty awesome! would you or any other friend here help me with this problem? or could you please tell me how i should write the custom ssh command for the rule to reboot just like the "reboot (via SSH)" function? Thanks! I was looking too fast at the screenshot in the original question and only noticed the incorrect uptime. I didn't notice the more issue related to the personalization string as you pointed out. The next release of Awesome Miner will correct both these issues. 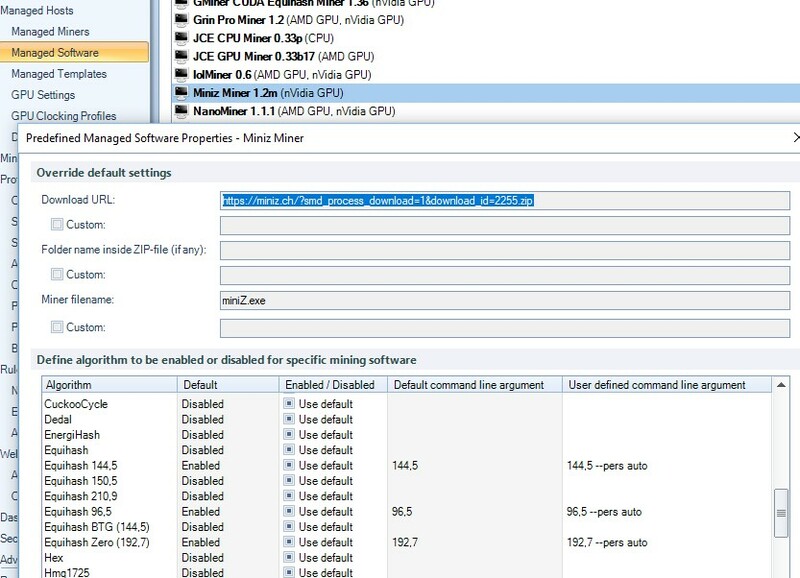 When you use the GPU Clocking dialog and select Save As, you can specify which GPU parameters to save to the profile. You can for example save only the fan speed property set to a value like 85%. I can agree that the usability should be improved a bit here. You can then have a rule to apply this "Fan 85%" clocking profile to a running miner. It will not change the Clocking Profile permanently, but it will change the fan to 85% for a running mining. It should be possible to use the Clocking Groups to combine different Clocking Profiles as well. Not only about having different Clocking Profiles for different GPU types, but also to apply multiple Clocking Profiles to the same GPU - where one profile could apply Fan speed only and another one the GPU/mem clocking. If this is the "Device command" action, it's only operations intended for ASIC miners and SgMiner - not for GPU mining in general. This is where you need to apply clocking profiles instead. Could this be that you have one default SSH username and password defined in the Options dialog, Mining Settings section, and then the SSH action is configured for another password? Leaving the username and password fields blank in the SSH action will result in the default settings being used. The username and password can also be configured per miner if needed. If you run into a failure with the reboot, you will typically see some details about the issue in the Awesome Miner log file. You can go to the toolbar Tools -> Log File right after you run into one of these failures to see if you find more details. I have no choice but to work with fixed speed, but it seems like a savage to have 80% a whole year a fan, that's why I like the automatic one more. What I propose are two easier solutions for everyone. At the time of defining an OC, I know that I can choose either fixed or auto, but inside the car there could be a box marked something like "aggressive" where the AUTO is higher than normal. Or a rule that really works in real time with the rig GPU without resigning. With aftherburner if you changed from auto to manual the fan, it did it without stopping to mine, because you can not do that AM through a rule ?. They have already passed the Nvidia documentation on the commands they use, sure there is a way to do it. That will allow an automatic use of the fan, and only if a card exceeds the limit, raise the speed to the whole rig, without having to restart mining. Creating Groups is not feasible for me having more than 100 profiles already made of OC, and OC groups are taking into account card by card, which would be many more. There must be something simpler, Just for that reason I'm rethinking Aftherburner although I know it has problems, but I can define an aggressive line of Automatico and leave the problem aside, but then every X time does not work and I have to change the folder The remote server is very messy. as you say in those two paragraphs. What I propose is to create two equal profiles, one with AUTO and another with a fixed speed fan, and by a rule use it. I do that when the temperature reaches 84 degrees and change to a very smooth OC and if it reaches 85 the miner stops. But when applying a rule I can only choose an OC to change. Whatever my OC, the rule will only change to an OC that I choose. It is not the solution I am looking for, since I use multiple OCs according to the AL-GO and the miner in question, I would have to make hundreds of rules, one for miners and for each personalized OC. If you already know that you can change the OC in real time and really use it to protect the cards. I do not understand why there can not be a rule that only changes the FAN regardless of the OC configuration that you are using, which are many. It is only the FAN is not complicated, the rule can take the current data of the OC that is in progress and only change the value of the FAN of AUTO to a fixed Speed, as easy as that. - Use rule action "Apply clocking profile", where you have a Clocking Profile set to 85% fan speed for example. That's the only property of the clocking profile so all this action will do is to change the fan speed and nothing else. No matter if you have few or many Clocking Profiles in general, you need one extra profile for setting only the fan speed to 85% in this case. - Use a new action concept to "Apply clocking setting" where you could select that you want the "Fan" property to be set to 85% for example. This would remove the need of the Clocking Profile containing the 85% fan speed property. There are no difference in behavior between these two ways, it's just that the second one doesn't require you to create a Clocking Profile for each fan speed level you want to set. In both cases, it's only the fan speed that is changed an no other overclocking settings.